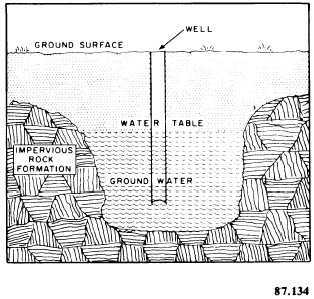 formations be studied when a ground source is being considered. It may be necessary to consider numerous other factors that may affect the reliability of the source. For one example; Lake Bonnie Rose, U.S. Naval Station, Adak, Alaska, is an ample source of cool, clear water, being distributed by gravity. However, the relatively high elevation of the lake results in excessive pressure at the station. Pressures are controlled by pressure-reducing valves. The valves sometimes fail in service, resulting in damage to the water system. Reliability of the source is further increased as the requirements for items that are subject to breakdown decrease (pumps, treatment plants, and so on). Legal advice may be necessary when selecting a water source as the laws regulating and controlling water rights may vary considerably. The title to ground and surface water in the United States is usually regulated at the state level. Navigable waters having interstate traffic are under federal control. Some difficulty was experienced in Vietnam by SEABEES in securing water rights to surface streams. These waters were used for flooding of rice fields, and local control denied the use of these sources as water supplies. Figure 9-4. - Limitation of water by rock formation. 2 months, waiting to obtain the right for the waterline to cross the ditch. Development of a water source includes all work that increases the quantity and improves the quality of the water, or makes it more readily available for treatment and distribution. The development of surface water sources, springs, and seawater sources is considered in this section. In developing a source, dams, floats, galleries, and similar improvements may be used to increase the quantity and quality of the water. Elaborate developments should be avoided; simplicity brings more rapid results. A temporary water source should not be converted into a permanent one until the area has been reconnoitered for a source requiring less development. All intake hoses or pipes should be equipped with an intake strainer regardless of the clearness of the water source. Suction strainers should be protected from floating debris that may damage, clog, or unnecessarily pollute them. Proper anchorage of suction lines and strainers prevents (1) loss of prime, (2) punctured or kinked lines, and (3) damage to strainers. Water at the intake point should be as clear and deep as possible. The strainer on the suction hose is placed at least 4 inches below the water level. This precaution reduces the possibility of the strainer becoming clogged with floating debris, or the prime being lost because of air getting into the suction line. Of the total amount of rainwater that falls upon the land surface of the earth, only a comparatively small part is absorbed by the soil. By far the greater part of it runs off the surface of the ground and is carried out to the sea by way of streams and rivers or remains stored in natural lakes and ponds and in artificial lakes and impounded reservoirs. The methods by which water supply is derived from the surface are (1) by damming of streams or rivers, (2) by using the flow from streams, (3) by pumping directly from surface streams, (4) by collecting water from the roofs of buildings, (5) by providing catchment areas for the collection of rainwater into specially constructed cisterns, (6) by solar distillation, (7) by power distillations, (8) by freezing, and (9) by electrodialysis.